One of the most tangible markers of a veteran’s military service is the awards and medals they earned while serving. In many families, these medals are regarded with reverence and are even proudly displayed on mantels or in rooms. But rather, unfortunately, medals are easily lost, stolen, or misplaced, meaning that a veteran and their family have lost a part of their past. Fortunately, seeking out replacements of these medals is easier than you might imagine. A new copy of the medal can be requested from the veteran’s respective branch of service, either by the veteran themselves or by you. 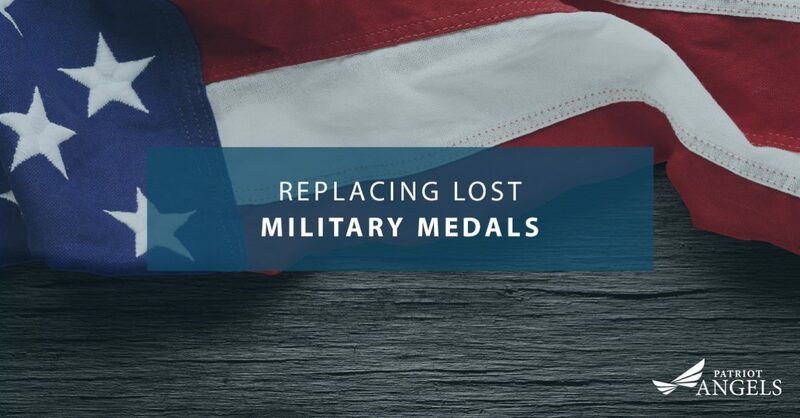 To help honor the service of your loved ones, Patriot Angels will outline the steps you need to take in order to replace these lost military medals. Who Can Request Replacement Medals and Decorations? If you do not fall into any of these next-of-kin categories, you will be considered a member of the general public. Members of the general public can still request copies of a veteran’s service records, but they are not able to request replacement medals. In this case, they will need to purchase these medals separately. For all branches except Army and Air Force, requests for replacement medals should be sent to the branch in which the veteran served. For veterans of the Army and Air Force, requests should be sent to the National Personnel Records Center in St. Louis, MO. Either the branch or the NPRC will verify the request and the veteran’s service record. From there, the medals and awards will be sent to the appropriate parties to be issued. Do These Replacements Cost Anything? For the most part, no. When requested by a veteran, the military branch will fulfill the request at no cost. For requests made by next-of-kin, there may be a cost associated with the request. This is true if the next-of-kin’s request involves research through archival records. However, these fees can be waived if the veteran has proved a signed authorization for the next-of-kin’s request. Additionally, if the veteran was awarded any medals or decorations from a foreign government, the branch will not be able to supply these awards. In these cases, you will need to purchase them separately. Not only does filling out a request for replacement medals offer you a tangible link to your veteran’s service, it also collects all of the information you would need to help them apply for the VA Aid and Attendance Pension. If you’re struggling to meet the long-term healthcare costs that your veteran needs, this pension can help relieve this financial burden. Contact us today to schedule a consultation.